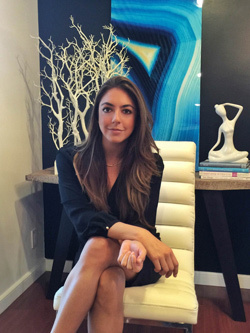 We sat down with Membership Director Andrea Lopez-Velarde to talk about how Elite Lifestyle Management — San Diego’s premier members-only lifestyle management and concierge firm — offers unique packages catered to law firms whose focus is on providing impeccable service to the clients they represent. From daily tasks to recurring challenges, ELM’s experienced and focused team provides seamless, comfortable and pleasurable experiences to its members. Q: How do law firms benefit from ELM’s services? A: The important thing to remember is that people will always associate a brand — be it a restaurant, a hotel or a law firm — with an emotion they felt when interacting with that brand. We deliver positive emotions: satisfaction, relaxation, contentment, delight. We help cultivate and strengthen long-term relationships, increase retention and build brand integrity. We help to create and promote that positive lasting impression upon clients and executives. A: It’s a pretty broad range — we offer benefits like reservations, errands, personal shopping, on-site assistance, travel planning, and meeting and event planning. The list is extensive, but what we specialize in are those detail-oriented tasks that free up our clients’ time — the time that they deserve. Q: Are the service packages customizable? A: Absolutely. Each package we put together for our clients is specially tailored to their needs. We want to exceed expectations in all situations, and we give nothing but personal white-glove attention to those we serve with packages that accommodate various lifestyles and corporate requirements. Q: What sets ELM apart from its competitors? A: Our No. 1 goal is to help our clients reclaim their most valuable asset —their time. Our motivation to help them in any way possible will always set us apart from other concierge and management companies. We don’t just pick up your dry cleaning. We enhance the quality of your life. Q: What types of clients do you typically cater to? A: From the busy traveler to the high-profile celebrity or the stay-at-home mom, we are experienced in assisting clients with a wide array of needs. Q: Is there a limit to your capabilities? A: No — as long as it falls under our broad guidelines, ELM ensures personalization to the highest degree. Our team of lifestyle managers handle daily needs, travel arrangements or any other requests. We operate 24/7. Q: What are some examples of requests you’ve received? A: Well, let’s just say that we’ve never let our clients down. We can charter a last-minute jet for you or dispute a charge on your phone bill. We get exclusive restaurant tables and event tickets, buy gifts for clients’ wives and moms, and plan everything from lunch events to exotic Middle East vacations. We get exciting and challenging requests every day and our clients love the results. -By Sarah C. Truckey. Submitted by Elite Lifestyle Management.